Jean-Baptiste Charbonneau was born in 1805 at Fort Mandan in North Dakota (USA). 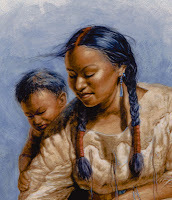 His mother was Sacagawea, an Indian Shoshone, and his father, a French Canadian trapper called Toussaint Charbonneau. The trapper and his wife worked in the Lewis and Clark expedition as interpreters. The baby travelled from North Dakota to Pacific Ocean and back, carried upon his mother’s back. Thanks to him and his mother, the native tribes thought they wanted peace. Warriors would not travel with a baby and his mother. The expedition leader William Clark nicknamed the boy “Little Pomp” or “Pompy”. Jean-Baptiste Charbonneau lived in Saint Louis, Missouri with Clark who loved him as his own son. Clark paid for his education. When he was 18, Jean-Baptiste Charbonneau, followed a German duke, went to Germany where he lived six years. He learnt four languages. During this period, he traveled across Europe and Africa with the duke. Then he came back to America and began a new life of hunting expedition. He was said to be “the best man on foot on the plains or in the Rocky Mountains”. Then, he fought with the US Army during the Mexican- American war. At the end of the war, he became mayor of a city. In his position he tried to defend the local Indians. In 1848 Charbonneau joined California to prospect for gold. He was a successful miner, so he kept working in the place for nearly sixteen years. Charbonneau died on May 16, 1866 in Oregon, reaching to Montana where new gold and silver mines were discovered.